Dexter feels most like himself when he’s with Harrison. As they enjoy their nightly bedtime ritual, he realizes his son knows about his box. Whether or not this is something a 2-yr. old will remember is something that haunts Dexter. Most kids hear fairy tales as bedtime stories, but Dexter offers Harrison monster stories and not the kind where things go bump in the night, rather the very real monsters that Dexter hunts down. But will Harrison one day see him as a monster too? So far in this season, LaGuerta main role has been bumping heads with the Deputy Chief. Now that she has her newest position, she’s pushing for Batista’s promotion to lieutenant; however, he has eyes for Deb and hates LaGuerta…not a promising combination. When presented with the opportunity, Deb initially laughs at the prospect, but begins to seriously consider what it would mean to become the head of the Miami Homicide Department. Just like Dexter, she sees Harry as a litmus test for her successes. Both siblings still need their father’s approval. 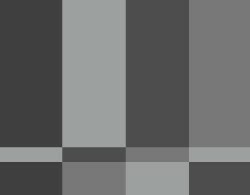 Of course Dexter’s litmus test is guided by the Code of Harry while Deb is in a position where she could go farther than Harry ever did. Deb lets Batista know what’s going on and originally it seems like he’s only pretending to be happy for her. It only seems this way if you’ve somehow forgotten how could a person Batista is, in a way that most people aren’t. Being a good person doesn’t stop him from directing any jealousy or anger he might be feeling at LaGuerta, which is understandable since if not for her, he might have had a shot at the position. Travis and his mentor Professor Gellar are burying what look like bodies but turn out to be mannequin parts, which we know from the season preview will play a role in one of their upcoming murders. We’re still not clear on how Travis and Gellar’s relationship came to be, but from this episode we learn a little more about their dynamic. Travis has a sister and when he missed an evening with Gellar to spend time with her, we saw the stronghold the mentor has over him. They believe it is the end of the world and Gellar has convinced him that he can’t be saved. Their conversations are a darker version of the one we hear between Harry and Dexter. Just like Dexter, Travis appears to be ruled by the belief that he is somehow flawed, a belief that is fueled by his mentor (Harry for Dexter and Gellar for Travis). And also similar to Dexter, Travis has an anchor to normalcy (Deb for Dexter and Lisa for Travis). This won’t be the first time Dexter has seen parts of his world in those of the killers he hunts down. 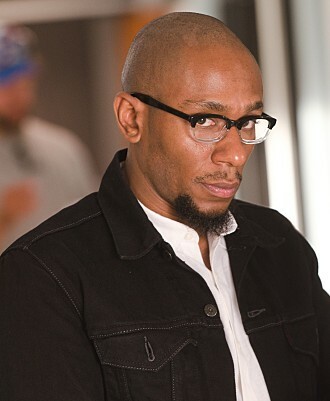 Brother Sam (Mos Def) is an ex-con who Dexter once planned to have on his table after he killed a hold-up victim. We learn that he’s connected to last’ week’s murder victim, Omar. 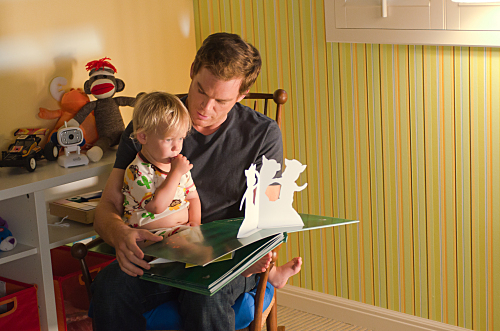 Sam is haunted by his past and believes that man can change, something we’ve seen Dexter also believe in the past. Dexter learns that Sam is still haunted by his “dark passenger” but he fights it every day. He’s not convinced of this, so he follows him and sees what looks like Sam killing a man and dumping the body in his trunk. Not at all what happened and Dexter finally understands that Sam just wants to protect his flock. He’s changed…as far as any of us know. Dexter’s substitute kill, Julio, doesn’t offer up any complexities, just a standard killing. Poor Quinn. His first (technically second) attempt at proposing crashed and burned. As Quinn sees it, Deb turned him down because she doesn’t want to choose between him and Dexter. The reality is, Deb wants something more than “no drama”. She may be moving steadily along a great career path, but the girl has clearly defined issues. Her “best” relationship was with another serial killer and she sabotaged the last relatively normal relationship she was in before Quinn. Quinn takes one last approach, complete with a romantic dinner and he’s shot down….again. He wants a more adult relationship, while Deb is content with how things have been. The conversation ends before Deb can tell him about her promotion, so once they’ve broken up, he naturally blames Dexter. In the end, she hasn’t chosen between her boyfriend and her brother, she’s decided to advance in her career. Something that’s not at all unexpected coming from Deb. So we end the evening exactly how we started…the bubble bath ritual. All his fears about Harrison have subsided because he’s decided that he can’t be himself around his son. He’ll distract him with his own toy box and child-appropriate bed time stories and eventually, all will be forgotten. But how long can Dexter hide himself from someone who’s a part of him? Through Sam we see more religious themes and it would be unrealistic to expect any of this to change Dexter’s opinion on religion, but what influence will all of this have on him by season’s end? Dexter can drag out a story all season, but in the best way possible. So it’s not clear how long it’ll take before he eventually crosses paths with Travis. It will be interesting to see if Dexter identifies with him or if Travis and Gellar’s relationship reminds Dexter more of his future with Harrison. Can they please name the newest serial killers already? Trinity Killer and Ice Truck Killer weren’t all that imaginative, but regardless, it’s a Dexter tradition. Should I pay more attention to Masuka’s new intern? Outside of being hot and flirting with Masuka, she hasn’t really done anything…which makes me worry that she’s somehow of importance to the overall season.